Chateau Le Tour was an amazing find. Many of the luscious looking properties listed on booking.com—and in my price range—were already sold out. I had a very specific image in my mind of what kind of place we wanted to stay in to have a nostalgic French countryside retreat. 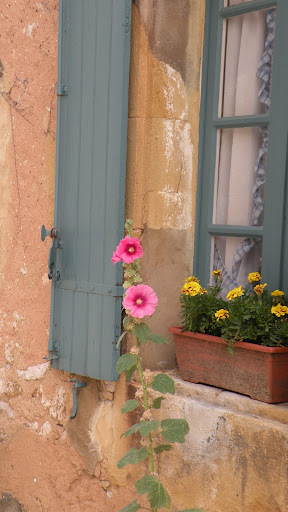 Back in 1995 when we traveled around the Dordogne with Julia, we spent many happy days at beautiful properties with swimming pools, leafy trees, and white-washed rooms. 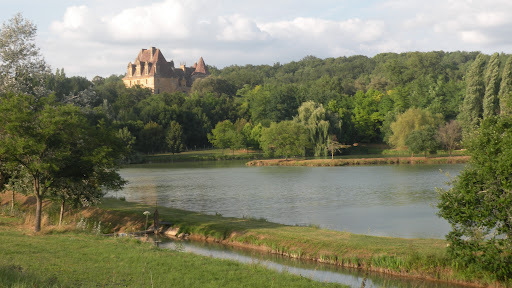 I had been looking in the Dordogne region for the perfect place since last February. Occasionally I’d book something, only to unbook it a few weeks later as we continued to discuss and refine our plans. 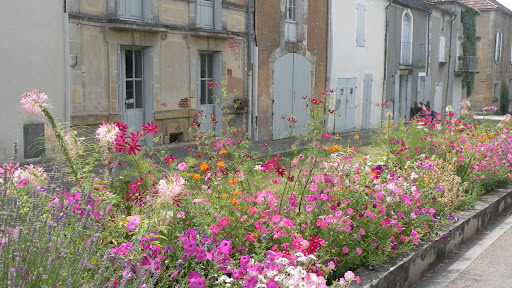 For awhile, we’d decided to skip the Dordogne altogether and spend some time along the Atlantic coast near La Rochelle. But after several forays into beach locations in Portugal and Spain, we decided that the beach scene wasn’t for us. 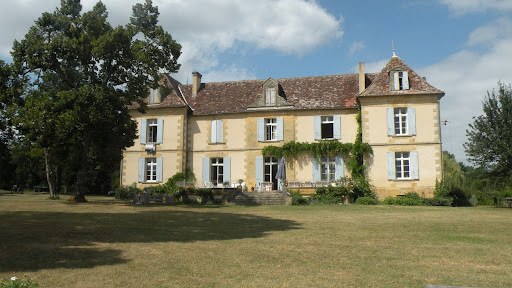 So back to booking.com to find that elusive perfect place Just a few days before we got here I found Chateau le Tour. It had just five reviews on booking.com and none on Trip advisor. I read that the place had just opened a few months before and decided to take a chance. The location was right, the price was right, and the pictures looked terrific. Well, I was right! Chateau Le Tour has turned out to be one of the most perfect places we have stayed. 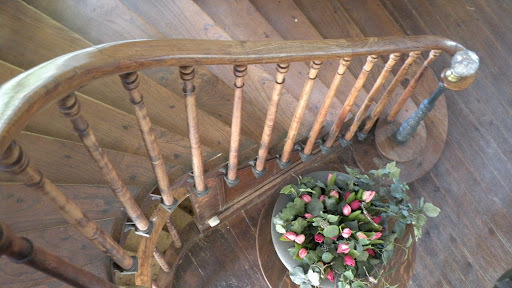 It is a 19th Century chateau with high ceilinged rooms, tall windows letting in soft breezes, and wonderful hosts. Our corner room has two windows – one looking out to the long white driveway at the front of the property and one off the bathroom overlooking huge deciduous trees. 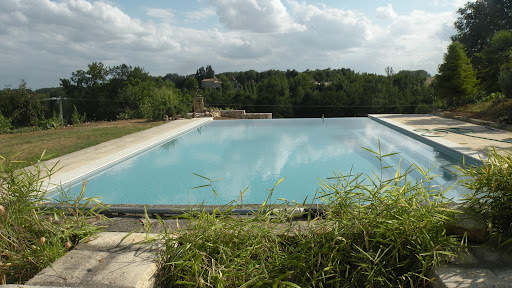 The infinity swimming pool is large and the perfect temperature for cooling off. I can swim lengths and actually get a fairly good work out. I love looking down the full length of the pool and seeing the water appear to drop off into the valley below. The infinity effect is very cool! 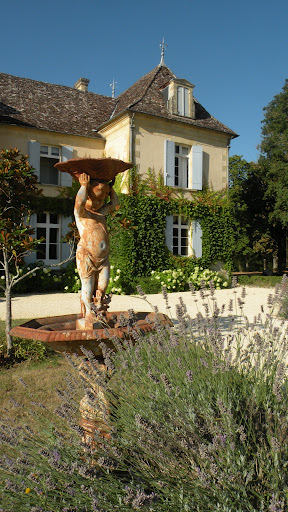 On our first evening at Chateau le Tour, we gratefully cooled off in the pool in a perfect late afternoon sun. I then retired to a comfortable couch on the terrace with a glass of local rose wine and my computer to do some editing on The Painter’s Daughter. That’s the latest title, by the way, of my novel about Sofia Carelli, a woman painter in 14thCentury Tuscany. After a perfect hour of enjoying the wine, the view, and the editing, I was joined by some of the other guests. At the moment, all the other guests are either Dutch (most of them) or English. We’re the only North Americans. In fact, we have yet to meet anyone else from North America – Canada or the States – since we came to Europe three weeks ago. Weird. The owners of Chateau Le Tour are a lovely Dutch couple with two teenage boys and a dog named Toby. They just bought the property in November and have spent the winter getting it ready to receive guests. 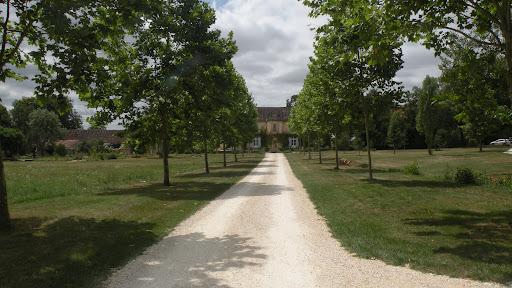 In addition to five rooms in the main chateau (where we are staying) they rent out some gites by the week and a very large farmhouse (the “Bergerie”) that sleeps 16. This place would be perfect for a large reunion! The large old bell clanged out to call everyone to dinner. About 14 people gathered around a long table set on the terrace. 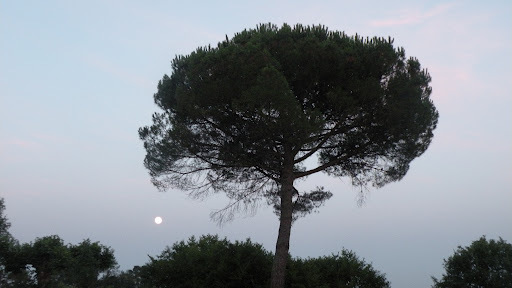 For the next three hours as the light slowly faded and the moon rose over the southern pine on the front lawn, we ate and drank and conversed in Dutch and English. 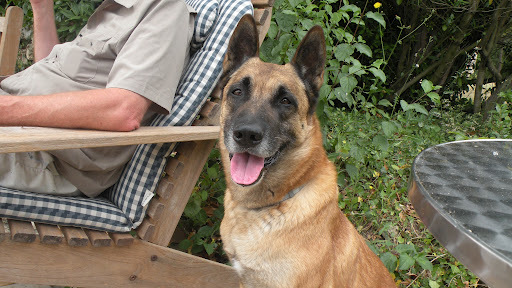 I learned how to tell the resident dog (Toby) how to put his paw on my knee in Dutch. He’s a beautiful dog with one of the gentlest faces I’ve ever seen. When I took the picture below, I said “Toby” and he actually smiled when he looked up and saw the camera. Dinner consisted to fresh gazpacho made with tomatoes, onions, garlic and peppers straight from Aneke’s garden. Every mouthful tasted like summer! We were then served big platters of pork medallions and pork chops with a prune cream sauce (fabulous), wonderful roast potatoes, and a heaping mound of beets so fresh that they felt like they were still growing! I don’t really like beets but these beets were something else. I ate every scrap. And everything was washed down with copious amounts of rose wine from a local winery. After the main course, we were served cheese and crackers and a local red wine. By the time I staggered upstairs to bed, it was almost midnight. What an evening! 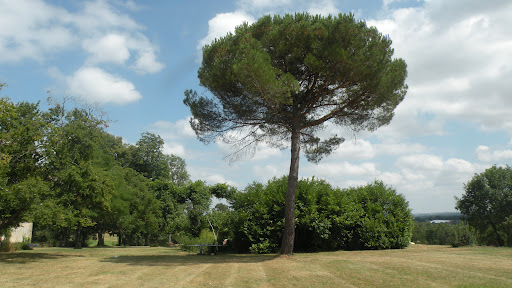 On our first full day at Chateau Le Tour, we decided to stay put and do just about nothing. Gregg wandered off and did some drawing, I hung out in the room for awhile and updated my blog, then we shared a picnic lunch by the pool. 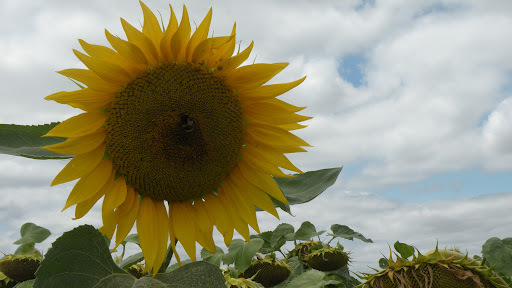 In the afternoon we took a walk around the property and out to the road past a field of fading sunflowers. 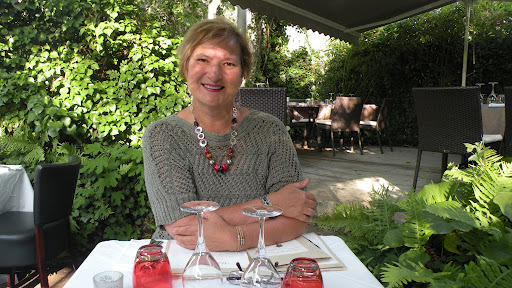 In the evening, we drove to a nearby village and enjoyed the perfect French country meal. I had been looking forward to duck confit for months and so that’s exactly what I had. The four course meal with wine set us back about 60 euros which is relatively expensive for this trip but in the grand scheme of things, considering what we got, was dead cheap (about $75 Cdn). On our second day at the Chateau Le Tour, we enjoyed a leisurely breakfast and then set out to explore some of the countryside. 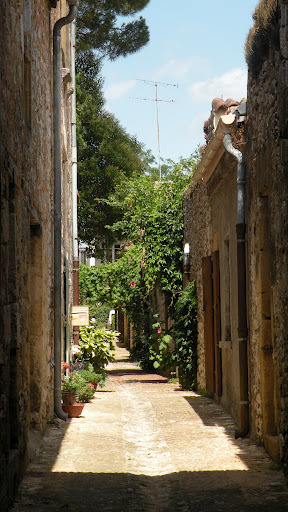 Aneke recommended we check out Monpazier, a bastide town about 30 minutes away. She gave me a super detailed map of the region so I was able to navigate the tiny roads with ease. What a relief! I have been depending on my ipad maps for navigation, which has sometimes (actually quite often) been a mistake. I have discovered that there is still no viable replacement for a really good and detailed Michelin paper map. Nice to see some things don’t change. 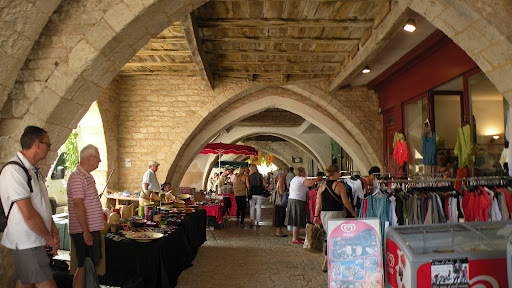 Monpazier was mobbed with tourists exploring the market. 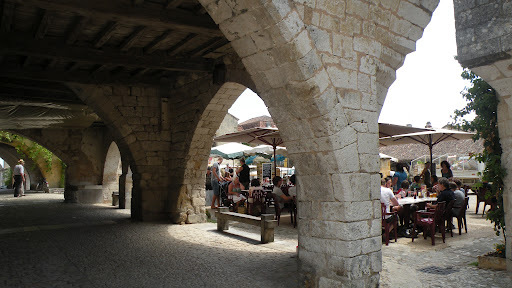 Stalls lined the narrow streets and crowded into the town square. 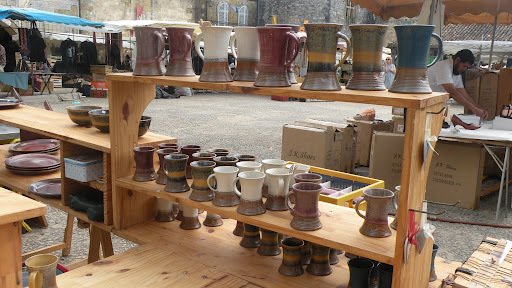 Most of the stalls sold either clothes or jewelry or food. We bought a beautiful pottery plate and two mugs from a guy selling his wife’s work. 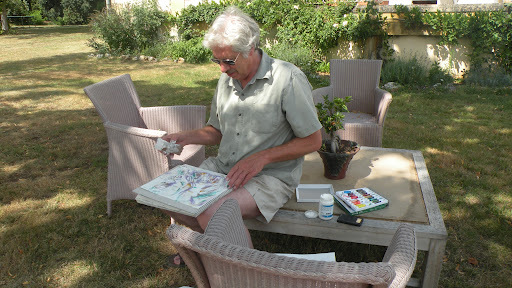 He explained (en francais) all about the process used to create the pieces, the glazes he used, etc. I didn’t really understand much but he was very friendly and Gregg told him he was a painter. We appreciate any chance to practice our French even when we don’t get one word in ten! We enjoyed a great lunch at one of the little cafes in the town square as the market started to dismantle. It was amusing to watch large vans maneuver through the crowds and extremely tight spaces to get into the square and load up goods. I saw one large van literally miss a table full of jewelry by one inch. After lunch we bought more souvenirs from a lovely soap shop. I’m a total sucker for soap and this stuff is very different—kind of pumice-like lozenges that look like hunks of lava more than soap. But they smell great! We meandered back through the scenic country roads to the Chateau Le Tour for a few more hours of relaxation by the pool. This place is so incredibly relaxing. Gregg had mentioned to the owners that he was a drummer and so one of the two teenage sons set his drum set up for Gregg in the barn. Gregg got to whale away for quite awhile after which we enjoyed a swim and, believe it or not, a game of ping pong at the outdoor ping pong table. 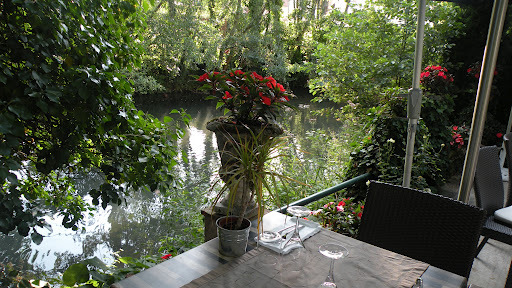 In the evening, we went out for dinner at Au Fil de L’eau. I thought that the dinner we had the night before had been great. This dinner was even better! Here’s the web site: http://www.au-fil-de-leau.net/accueil.html The setting is as beautiful in real life as it appears on the Web site. 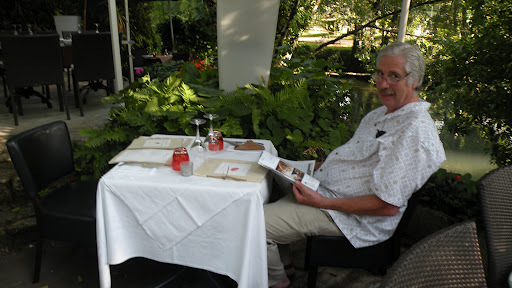 We enjoyed one of the best meals I’ve ever had. 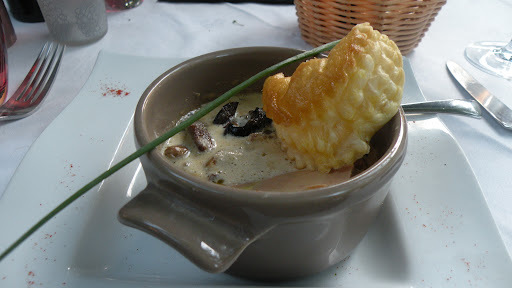 I ordered escargots in a cream sauce (to die for) followed by veal in a cream sauce followed by a cheese course (by this time I was getting almost too full to eat it) and finished with crème brulee. The waiter served the crème brulee, doused it with brandy and then lit in on fire. The little girl at the next table was fascinated! Throughout the dinner, we sipped wine from a local winery and listened to the ducks quacking in the river below. It was magical! And so with a sad heart but again excited for a new adventure, we left Chateau Le Tour the next morning to drive to the Loire Valley. Aneke and Edward Taylor, our hosts, saw us off with great warmth. They were the very best hosts!